Favorite Hotels Outside Venice for your best Italy trip! Which are the best hotels outside Venice? Why do people sleep in hotels outside Venice? Because they think they save money? I do not agree, because there are more disadvantages than advantages if you want to visit the city really. I will tell you the benefits. I think the biggest advantage with hotels outside the city of Venice is that the restaurants around the hotels are cheaper than in Venice. 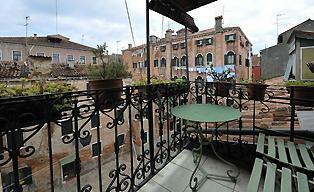 The performance of a hotel outside Venice are better if you compare it on price & quality. Venice hotels are using often decorated old Venetian style wallpaper and furniture’s. It can look creepy and vintage. Hotels outside Venice can be modern, with plenty of parking place. Take the town of Treviso. It is 27 miles outside of Venice. This is a beautiful setting with a charming old center. From Treviso Airport to Treviso center you can take a taxi or bus no.6. With a hotel on the island of Lido, you can use the long stretched beaches. Ideal if you go with kids and just want to be a day at the beach and a day wandering through Venice Italy. On the island of Lido, the roads and pavements are wider and everything is more spacious than Venice. With vaporetto boats to the city of Venice, there are plenty of connections. It takes 20 minutes to St. Mark's Square. Hotel on Lido? Only 2 minutes away from the beach you have Hotel Byron ***. In August the fares are around € 130, - for a double room. The city of Mestre has some nice streets and squares. But the urban feeling is strongly present. Honking traffic, crowds and industry makes it less appealing to me. But it's okay if you sleep in a hotel close to the train station. By train you have easy access to Venice. 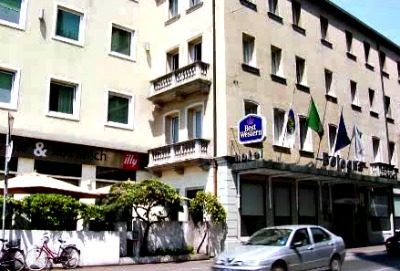 Very near the train station is the qualitative Best Western Hotel Bologna ****. With the train or bus you have a fast connection to Venice. The rates for a night stay are on average € 130, - per night. I wrote about it in my blog; searching for an airport hotel? 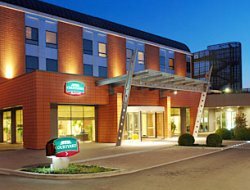 I choose the Courtyard by Marriott ****. This hotel is next to Marco Polo Airport. 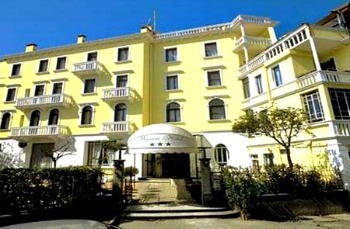 For this quality hotel the rates for one room are on average € 110, - per night. There are plenty of transport options. This hotel has its own shuttle service to Venice. Ideal!!! In Venice there are charming hotels to find! As I said, I my opinion there are more disadvantages with a hotels outside Venice when you compare it with a hotel in Venice. 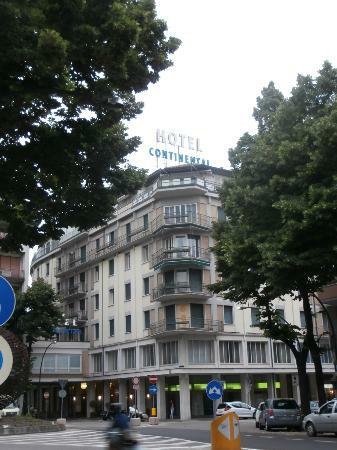 It's just not the same as a hotel in the historical city of Venice. If you have doubt about the room rates, there are plenty of alternatives like; Bed & Breakfast, hostels and apartments. Their quality is sufficient. Transportation between a hotel outside Venice can add up your budget and you may realize that a hotel outside Venice isn’t cheaper than a hotel in Venice. The tourist’s crowds are leaving the city and you go with the flow. In my opinion staying in Venice and wandering home to your sleeping place in Venice after you just enjoyed a nice dinner is the most convenient a traveler can have. I think it's good that you're going to immerse yourself in the wonderful surroundings of Venice. After 21:00 it is quieter in the city and the view is stunning. The same is true in the morning. Until 10:00 it is wonderful to be in the city. The town is coming to life. My tip; is to wake up at sunrise and go out to take great pictures. Or take a fresh cappuccino in the cafe’s that are already open. For example, I had my finest coffee ever early in the morning at Torrefazione Marchi. You must realize; Venice has no traffic and no cyclists. So those sounds you do not hear. It is therefore very pleasant and quieter than you think. Especially with children, because you do not have to keep them off the streets. You've read about hotels outside of Venice. There is plenty to explore. Read my site on Venice and get more information about this beautiful Italian city.